I recently upgraded my AT&T S7 Edge to Nougat 7.0 and 1Password would update all of my passwords each time I used it. It would rewrite every password record, which takes a long time. I uninstalled 1Password to try to resolve this issue and when I try to install it again it says it is not compatible with my device. It says "Not compatible with this version." 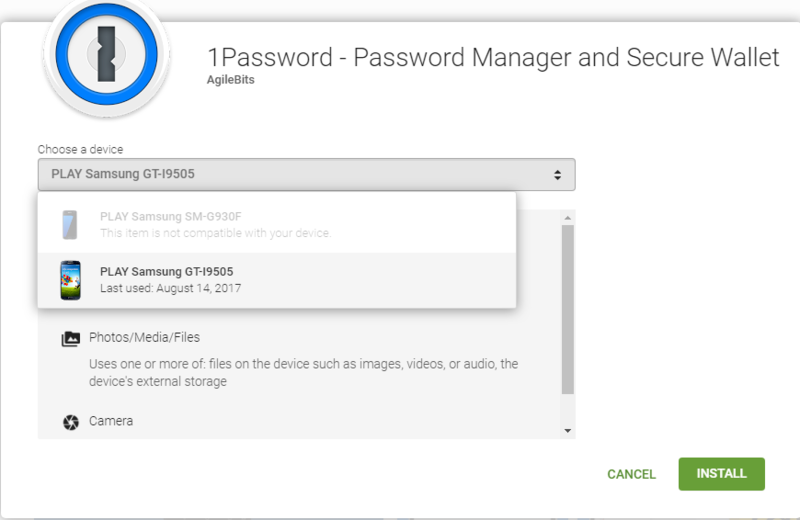 @ebertojr: That's very strange, as 1Password for Android version 6 definitely supports Android 7...and I haven't heard of issues with recent Galaxy devices either. Do you mean that the Google Play store won't even install 1Password now? Under the circumstances, I'm not sure what 1Password can do to help, since we won't even be able to get diagnostics — it isn't even there. Have you "rooted" the device to run a custom OS, or otherwise modified the Play store? Let me know what you find! Stranger yet, I just tried it and it installed with no issues! Thanks for following up. Thanks for the update! I'm glad to hear that. Please let us know if you have any trouble again in the future. I'm having the same issue. But there's no option to install it on the Google play store. @buzzby75: Unfortunately that isn't something we can help with, as the Google Play store is owned and operated solely by Google. Do you perhaps already have 1Password installed, or your device/software is not compatible? What are you seeing exactly? Ultimately you may need help from Google or the device vendor, but I can at least try to point you in the right direction if you'll provide some basic information. Thanks in advance! I've manage to get the app on to my phone. But can't remember any of my log in details. I want to purchase the pro version of the app. Hey @buzzby75. If you're being prompted for an email address, Secret Key, and sign-in address, then this is for a 1Password account. You're welcome to sign up for one if you like. With an active account, the Pro features are unlocked automatically. Otherwise, you'll need to sync an existing vault. Were you previously using 1Password on another device? If so, had you configured sync with Dropbox or another method? If anyone else runs into this, they might want to try installing the app remotely using Google's Web version of the play store. If you get the same error, I believe the web version of the play store will allow you to click on a "+" sign on the error message for some insight as to why you can't install it. There are tons of reasons such as carrier block, wrong or not supported Android version, maturity rating (although I think the latter wouldn't apply to 1Password), etc. I'd never thought to try that. Can always view 1Password in the Google Play store here in a desktop browser. Not a bad idea! Hi @msimoes. Can you go to Settings > Display and change the resolution to the highest setting? Then go to Settings > Apps > Google Play Store > Storage and tap Clear Cache. Once you do that, reboot the device. Are you able to install after following those steps? I have the same issue with my Samsung S7. First time I am unable to install an application. I followed the steps above to no avail. @richard_gruzin: I'm sorry to hear that. Unfortunately the Google Play installation process isn't something we have any control over, and it sounds like there may be a deeper issue on your device if Google Play is saying it isn't compatible even after clearing the cache. What else have you tried? Do you have Google Play itself up to date, and are there any other customizations that might be confusing Google Play into thinking your device is incompatible? I have everything up to date and all my settings are generally default, I use many applications from google play store. This is the first time I cannot install an application from google play store. This is unlikely that this is an issue with my phone. @richard_gruzin: For example, did you try remotely installing the app from a desktop web browser as Thelauffer suggested above? Hello, No my phone has never been rooted. I tried to install this app by play store in google chrome, but when I choose my phone Samsung Galaxy S7 (SM-G930F) it says that the app is not compatible with my phone. Unbelievable. One of the most used phones out there. You must have selected that this phone is not supported when you deployed the app into google play store. Hello, No my phone has never been rooted. @richard_gruzin: I didn't think so, but thanks for confirming, as this is really strange. I tried to install this app by play store in google chrome, but when I choose my phone Samsung Galaxy S7 (SM-G930F) it says that the app is not compatible with my phone. Unbelievable. One of the most used phones out there. You must have selected that this phone is not supported when you deployed the app into google play store. Nope. We have people using 1Password on S7. I'm not sure why Google won't allow you to install it onto yours. What resolution are you running at? That's the most common cause for issues like this. What model is this exactly? I wonder if it's a regional version we haven't tested, though I've never heard of others being completely unable to run 1Password on a Samsung device. @richard_gruzin: Thanks! I saw that in your screenshot, but I'm not super familiar with different regional models. Maybe it doesn't apply to that device. But for example, when I purchased a "Nexus 6P", there were at least two very different SKUs for different regions. Very confusing. What about your display setting? I checked HD (1280x720), FHD (1920x1080) and WQHD (2560x1440) all the same. @brenty in general I have never ever come across an app that I was not able to install. It means that it is an issue with your app, not my phone. @brenty you must have changed something in the play store, I was able to install the app today. Try installing the 1Password app from the Play Store again and let us know if you are successful this time! @MattMCG Could you try these steps and let us know if you’re able to install the 1Password app? Thanks! @richard_gruzin We didn’t change any requirements in the app, but I'm glad to hear you can install 1Password again! Did you change your screen resolution since the error? Awesome! Thanks for the update. Glad that did the trick for you.